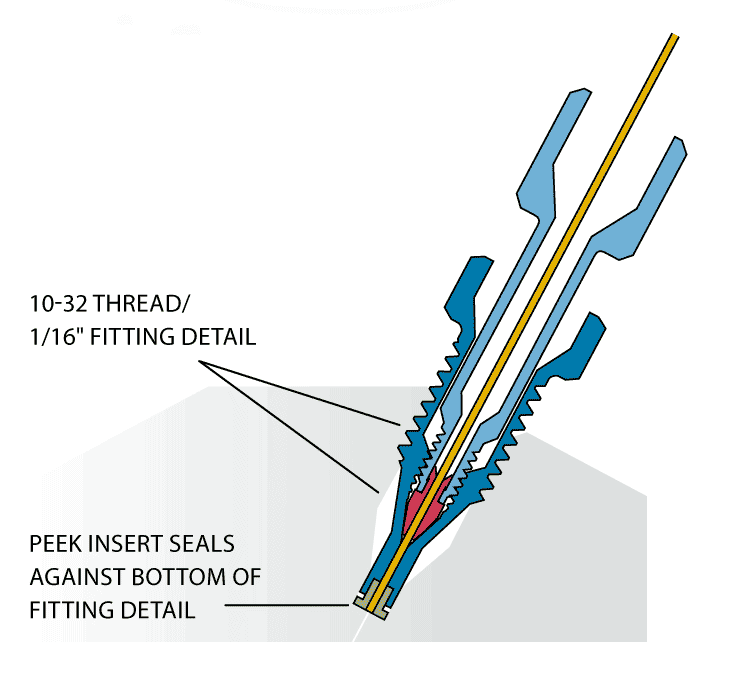 NOTE: To ensure zero dead volume with this or any other fitting that seals on the end of the FS tube, the tube end must be prepped with our fused silica cutting/polishing kit, product number FS-KIT. Our new C360IZR1 fitting connects a 360 µm FS tube directly into a 1/16" fitting detail, with the bore of the FS tube precisely aligning with the bore of the valve. Call to discuss your application. After the lapping operation, the fused silica line can be ruggedized by threading it through a length of 1/32" OD x .020" ID PEEK or ETFE tubing (product numbers TPK.520 or TTZ.520). The protective sleeve should run the entire length of the line, terminating about 1/4" inside the secondary fitting (the lighter blue part in the illustration). The fittings below are standard length, with a glass-filled PEEK ferrule. Call for other options.